The “last rampart of the Rockies” sits south of Santa Fe, where the Sangre de Cristo Mountains peter out into foothills. Ernest Thompson Seton considered it the most appropriate place to build his final home, and he chose to make it a castle. From 1930 until his death in 1946, Seton built not only a castle, but a village, a children’s camp, a printing press and a teaching and cultural community that focused on his interest in wildlife conservation and Native people. If there’s anything more romantic than a castle, it has to be the ruins of one. And today, ruins are the only evidence of Seton’s Arroyo Hondo monument. 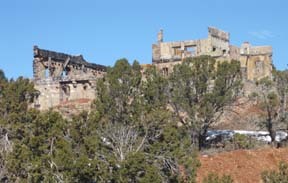 A fire of unknown origin destroyed the National Historic Landmark in under two hours in 2005. Now owned by a nonprofit educational think tank, the Academy for the Love of Learning, it’s set to become a contemplative garden within the agency’s otherwise modern complex – a LEED-certified educational building with a gallery, meditation room and classrooms. With the approach of the May opening of the exhibit, “Wild at Heart: Ernest Thompson Seton,” at the New Mexico History Museum, the Academy staff treated a few of us to a tour of their under-construction digs. The highlight of our trip: a stroll through the rubble of the old Seton Castle. Snow fought with mud for control of our boots. Rootless tumbleweeds clustered along the chainlink fence surrounding it. The stubs of stone walls, plaster peeling off, stood sentry. Charred wooden beams balanced between the floor and a former ceiling. Strings of electrical wiring jutted from the walls, useless and bobbing with the breeze. “This was both the weirdest place I’ve ever been in, and the most charming,” said Aaron Stern, the Academy’s founder. Seton is a renowned conservationist, ranked with the likes of Audubon and Burroughs, who wrote more than 60 books and helped found the Boy Scouts of America He was also an incomparable artist who painted and drew images from the natural world. The Academy obtained the property in 2003 from his adopted daughter, Dee Seton. The castle, Stern recalled, was still filled with his books, artwork, music and a chair magnificent enough to have been dubbed, by the Academy staff anyway, a throne. 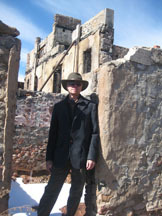 During his years in the castle, Seton became associated with people like author and artist Alfred Morang; sculptor and Van Briggle master potter Clem Hull; painter Georgia O’Keeffe; painter Randall Davey; painter Raymond Jonson, leader of the Transcendental Painters Group; and artist Eliseo Rodriguez. At the time of the fire, work was underway was to renovate the 32-room, 6,900-square-foot castle into the Academy’s headquarters. Despite its charms, said David L. Witt, (photo at left) director of the Academy’s Seton Legacy Project and curator of Wild at Heart, the place bore all the signs of a grand eccentric at work. As it turns out, it caught fire at the very moment that Witt was in a nearby building, discussing its grand re-opening with residents of Seton Village. By the time 20 minutes had passed, the top of the castle was gone. No one was hurt, but federal arson investigators never pinpointed a cause. “What would make him build this grandiose, ridiculous building on the southern rampart of the Rockies when it was just him and his wife?” asked Witt (Dee was adopted after its construction). “I’ve thought about that a lot. I know he was incredibly critical of his father. In his autobiography, he criticized his father for everything he did as too grandiose. It wasn’t his only self-designed mansion, either. Seton had earlier constructed “Wyndygoul,” a grand country estate in Cos Cob, Conn., (the sale of which shocked a 1912 New York Times writer) and “DeWinton,” an even grander estate in Greenwich, Conn., before returning to New Mexico for his final years. When completed in August, the Academy will operate its headquarters as private property. Participants in its workshops will be able to visit the ruins, as will members of the public on special occasions. There, they might hear literary readings or musical performances. 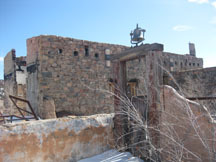 They might wander the remains and marvel at the kachinas Seton included on the walls, enjoy the 360-degree views or simply find a measure of the peace within nature — something Seton himself so loved. From 1930 until his death in 1946, Seton built not only a castle, but a village, a children’s camp, a printing press and a teaching and cultural community that focused on his interest in wildlife conservation and Native peoples. If there’s anything more romantic than a castle, it has to be the ruins of one. And today, ruins are all that’s left of Seton’s Arroyo Hondo monument. A fire of unknown origin destroyed it in under an hour in 2005. Now owned by an educational think tank, the Academy for the Love of Learning, it’s set to become a contemplative garden of the agency’s otherwise modern complex – a LEED-certified educational building with a gallery, meditation room and classrooms. With the approach of the May opening of Wild at Heart: Ernest Thompson Seton at the New Mexico History Museum, the Academy staff treated a few of us to a tour of their under-construction digs. The highlight of our trip: a stroll through the rubble of the old Seton Castle. Snow fought with mud for control of our boots. Rootless tumbleweeds clustered along the chainlink fence surrounding it. The stubs of stone walls with plaster peeling off stood sentry. Charred wooden beams balanced between floor and a former ceiling. Strings of electrical wiring jutted from the walls, useless and bobbing with the breeze. 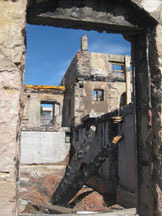 At the time of the fire, Academy leaders were attempting to renovate the since-abandoned castle into their headquarters. When they obtained it from Dee Seton, the adopted daughter of the artist and conservationist, it was still filled with his books, artwork, music and a chair magnificent enough to have been dubbed a throne. Despite its charms, said David L. Witt, director of the Academy’s Seton Legacy Project and curator of Wild at Heart, the place bore all the signs of a grand eccentric at work. It wasn’t his only castle, either. Seton had earlier constructed a castle in Connecticut before returning to New Mexico for his final years. The Academy will operate its headquarters as private property. Participants in its workshops will be able to visit the ruins, along with members of the public on special occasions. There, they might hear literary readings or musical performances. 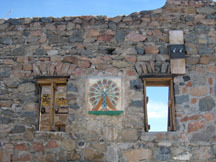 They might just wander the remains and marvel at the kachinas Seton included on the walls, enjoy the 360-degree views or simply find a measure of the peace within nature that Seton himself so loved.